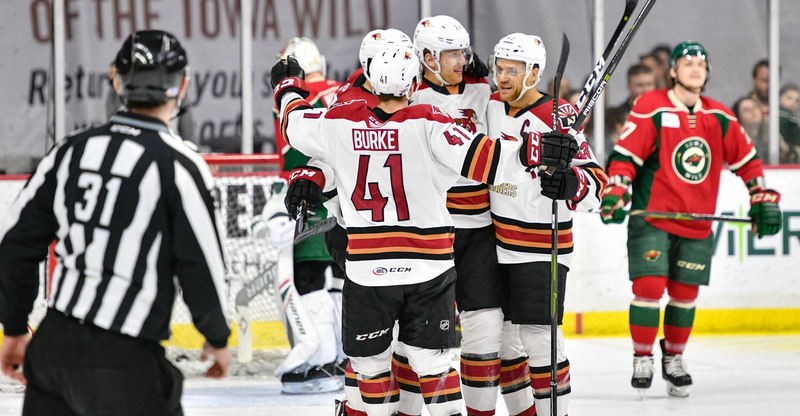 Following a spectacular second period offensive outburst, the Roadrunners were able to hang on to weather a late pushback Tuesday night, defeating the Iowa Wild by a 5-4 final at Wells Fargo Arena. With the win, the Roadrunners, now with 72 standings points, have climbed to within one point of a playoff spot in the Pacific Division, trailing both the fourth-place Colorado Eagles (73) and the third-place San Diego Gulls (73) by a slim, slim margin. The team continues its astounding rebound, improving its record to 7-1-0-1 over its past nine games to come alive with authority after trudging through a preceding seven-game losing streak from February 20 – March 9, the longest in club history. Yet again, the Roadrunners were able to find the back of the net early, Hudson Fasching doing so on the game’s opening shift, stuffing a rebound past Iowa’s Andrew Hammond 44 seconds into the contest to give Tucson a 1-0 lead. The Wild would tie the game just over five minutes later, the teams heading to the second period even at 1-1. Tucson’s offense exploded for four straight goals in the second period to jump to a commanding 5-1 lead. Less than three minutes into the middle frame, Matteo Gennaro, after putting in magnificent work on the forecheck, received a pass as he positioned himself at the top of the crease and buried a backhand shot to give the Roadrunners a 2-1 lead. Brayden Burke, with the assist on Gennaro's goal, registered his 30th point of the season, becoming the sixth rookie in franchise history to hit that mark. Just past the midway point of the second, and after a beautiful regroup in the neutral zone, the Roadrunners attacked Iowa territory on a three-on-one. Jens Looke left a drop pass for Trevor Cheek, who wired home a wrist shot to give the Roadrunners a 3-1 lead, netting his sixth goal of the campaign. Michael Bunting then broke the score wide open with a pair of goals in a 1:50 span. Bunting’s first came via a wrist shot from the high-slot during four-on-four play after he circled into open ice to bury his look to the top shelf. Moments later, Bunting broke through the neutral zone and transitioned to skate alone in on a breakaway, where he deposited up high yet again, this time scoring to the stick side to give the Roadrunners a four goal cushion. 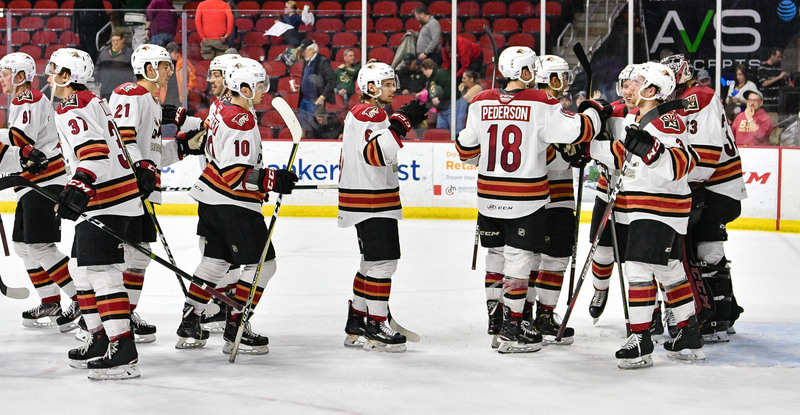 The Wild gave the Roadrunners a scare, scoring three straight goals in the third period to cut Tucson’s lead to one. Backed by a few key saves from Adin Hill late, the Roadrunners hung on to secure a 5-4 victory. Hill, who stopped 23 of the 27 shots he faced, earned his 15th win of the season and his 50th as a member of the Roadrunners. The team will continue its four-game road trip Wednesday night to take on the Wild in a rematch at Wells Fargo Arena, where the puck is scheduled to drop just after 5:00 PM PST.